Werner's Cairns blog: Turmeric, not just a humble spice. Turmeric has been used in India throughout history as a condiment, healing remedy and textile dye. But in recent times it has come to the fore as a contributor to good health and a pain killer. Turmeric was traditionally called Indian saffron since its deep yellow-orange colour is similar to that of the prized saffron. Turmeric is anti bacterial and anti inflammatory. I have been taking a heaped teaspoon of organic turmeric powder daily for more than two years and I’m sure that it has contributed to my good health. It is important that turmeric powder is taken in conjunction with fat and black pepper to help the body to absorb it, it is the piperine in the pepper that is doing it. My way of taking my daily dose of turmeric is as follows: 1. I toast a slice of wholemeal bread, and saturate it with coconut oil. 2. I put a heaped teaspoon of turmeric powder on top of it and spread it over the bread. 3. Then I add a liberal amount of black pepper and top it up with chicken or ham, and greens from my garden or whatever you fancy. As the saying goes: “Variety is the spice of life” to which I add – “Eating turmeric is wise”. Turmeric is easy to grow and the tubers can be grated on salad or veggies for extra flavour. It grows about 60 cm high and when the leaves are yellowing and start to wilt, that is the time for harvesting it. 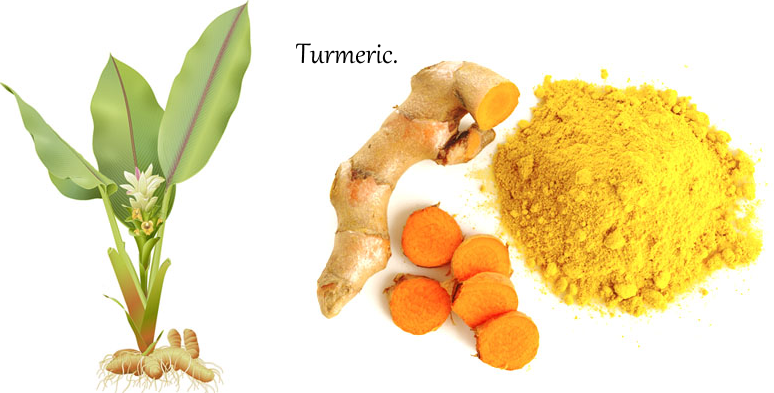 Turmeric comes from the root of the Curcuma longa plant and has a tough brown skin and a deep orange flesh. This herb has a very interesting taste and aroma. Its flavour is peppery, warm and bitter while its fragrance is mild yet slightly reminiscent of orange and ginger, to which it is related. Following is some information from a newsletter about Atherosclerosis, (Hardening of the arteries) which you may find interesting. For more turmeric information. Click here. My first encounter with atherosclerosis was a real sad one. I lost a good friend who was just 35 years of age because of the disease. We all were surprised as he looked healthy. That was the first time I came to know about the name but since then I have observed it and found it is not so rare. More than 4 mn people in US suffer from it. A bit more on atherosclerosis now. Atherosclerosis is a disease characterized by clogging and stiffening of arteries due to deposits of cholesterol, fats, and inflammatory deposits on the inner walls of the arteries. This causes various diseases based on the arteries affected like heart attack, stroke, etc. Generally people with diabetes mellitus, high cholesterol and fat content, high blood pressure, smoking habits, etc. are more susceptible to the disease than others. The foremost thing to treat atherosclerosis is to adopt healthy lifestyle choices, like avoid smoking, high fat-content diet, perform exercise regularly, etc. turmeric for atherosclerosis. The medications generally include drugs to lower blood glucose and cholesterol levels, hypertension, anticoagulants to reduce blood clots in the arteries and surgical procedures. Apart from general medication, several herbs like turmeric, green tea pomegranate juice, garlic and dietary supplements like fish oils have shown a huge promise in reducing the clogging of arteries and long term treatment and reversal of the disease, while reducing the general side effects of drugs and elimination needs of surgeries. This article will discuss the major role played by turmeric plays a major role in the maintenance of heart health, and thus helps in atherosclerosis. A very popular spice in the Indian kitchen, turmeric has been used in ancient medicine since centuries due to its amazing medicinal properties. The major active ingredient present in turmeric is curcumin, which possesses anti-bacterial, anti-inflammatory (prevents inflammation or allergies) and antioxidant (prevents oxidation of other molecules) properties. Overview. Studies have shown that turmeric can cure atherosclerosis due to its ability to reduce the blood cholesterol levels in the body, thus preventing plaque build-up in the arteries. Oxidation of bad cholesterol leads to the accumulation of fatty streaks along the arterial walls. Turmeric helps prevent arterial blockage by preventing this oxidation process. Moreover turmeric also acts as a vasodilatant (helps in relaxation of blood vessels), thus reducing the possibility of blocking of blood vessels. Also, turmeric can prevent the clumping together of blood platelets and inhibit blood clot formation. It also possesses anti-inflammatory properties and inhibits the inflammatory enzymes and pro-inflammatory genes (genes that produce inflammatory products), thus preventing inflammatory deposits on the inner walls of the blood vessels. Its anti-oxidant properties help to reduce formation of the free radicals (highly reactive chemical species that mediate inflammatory tissue injury), thereby further preventing inflammation. I discuss all these properties of turmeric and its ability to help in atherosclerosis in the following sections. 9 ways turmeric helps in Atherosclerosis. 1. Turmeric inhibits oxidation of bad cholesterol. An important effect of atherosclerosis is the accumulation of oxidized-lipid laden “foam cells” along the arterial walls. Thus, preventing oxidation of LDL could play a crucial role in preventing the formation of “foam cells” in the arteries and blockage. Research has shown that an important reason in atherosclerosis is the oxidation of bad cholesterol or Low Density Lipoprotein (LDL). A regular administration of turmeric extract helped in inhibiting the oxidation of Low Density Lipoproteins and maintaining the cholesterol levels within appropriate levels. What it means? Turmeric, due to its anti-oxidant properties prevents oxidation of bad cholesterol, and prevents fat and cholesterol deposits on the arterial walls. 2. Turmeric reduces atherosclerotic risks in diabetes 2 patients. Patients suffering from diabetes mellitus (Type II Diabetes) pose a higher risk for having atherosclerosis than others. This is because patients having Type II diabetes have an impaired repair response system, which increases the possibility of rupture of atherosclerotic plaques and hence formation of blood clots. A study with human subjects suffering from type 2 diabetes has shown that treatment of such patients with curcumin (the major active ingredient present in turmeric) exhibits an anti-atherosclerosis effect. Also, it helps in the lowering of the atherogenic risks in this high risk population, by reducing the insulin resistance (a condition where body does not use insulin effectively) and body fat content. What it means? But when these patients are given a fixed regular dosage of curcumin extract, it reduced the risks of atherosclerosis significantly by improving metabolic profiles of the body. 3. Turmeric reduces total cholesterol content and blots clots. One of the crucial events in atherosclerosis is activation of platelets and their recruitment of inflammatory cells at the sites of injury. Also, high cholesterol and LDL content is another crucial reason behind the plaque formation on the arterial walls. Research has shown that turmeric oil components have reduced total plasma cholesterol content, bad cholesterol or LDL content, lipid induced oxidative stress and platelet activation. What it means? Turmeric oil can play a role in preventing arterial thrombosis (blood clot in arteries) and atheroprogression. 4. Turmeric reduces oxidative stress and LDL peroxidation. Peroxidised Low Density Lipoprotein leads to the deposition of oxidized lipid coated fat cells and their proliferation along the arterial walls, narrowing the arteries. A research trial has shown that regular intake of turmeric, equivalent to 20 mg of the active ingredient curcumin, led to a decrease in peroxidation levels of LDL (low density lipoproteins) as well as HDL (High density lipoproteins) in patients having peroxidized LDL higher than baseline values. What it means? Turmeric can lower lipid levels and used for treatment of atherosclerotic patients. 5. Turmeric reduces plaque formation on arterial walls. One of the important events in atherosclerosis is increasing formation of plaque, due to proliferation of fibrous tissue, owing to the increased migration and proliferation of vascular smooth muscle cells. A Study has shown that turmeric helps in inhibiting the proliferation of Vascular Smooth Muscle Cells. 6. Turmeric causes vasorelaxation. The major effect of atherosclerosis is reduction in delivery of oxygenated blood due to arterial blockage. Studies have shown that turmeric extract helps in the lowering of heart rate and blood pressure in the arteries by inducing relaxation of the blood vessels. Another study has shown that an extract of turmeric helps in the improved vasorelaxation of arteries in hypercholesterolemic rats.This property of turmeric helps in the reducing the blockage of arteries, making it an effective complement for vasodilatant drugs (drugs that dilate arteries). What it means? Turmeric relaxes blood vessels, hence reduces blockage. 7. Turmeric reduces stroke damage. Atherosclerosis in the arteries of the brain leads to stroke. Curcumin itself cannot cross the blood-brain barrier efficiently; hence chemical modifications of curcumin have been carried out, to facilitate an enhanced penetration across the barrier. CNB-001, a novel hybrid compound of curcumin, helps to repair the damage caused by stroke at a neuronal level, due to neuro-protective properties of curcumin. CNB-001 has been proved to be therapeutically safe and an effective treatment for stroke. What it means? Turmeric compounds reduce motor impairment (loss of muscle control, paralysis) caused by a stroke. 8. Turmeric inhibits platelet aggregation. Obesity is one of the major risk factors for patients to suffer from atherosclerosis. A recent study has shown that curcumin, the active ingredient of turmeric and its derivative, bisdemothoxycurcumin (BDMC) possess anti-coagulant properties, by inhibiting thrombin activities, thus preventing blood clot formation. Another related research has shown that turmeric inhibits platelet aggregation induced by arachidonate by inhibiting thromboxane production from arachidonic acid. What it means? Turmeric reduces the formation of blood clots inside the arteries, thus preventing arterial blockage. 9. Turmeric helps in reducing obesity. Obesity is one of the major risk factors for patients to suffer from atherosclerosis. Study has shown that curcumin has the ability to reduce obesity, along with obesity related disorders by inhibiting the differentiation of adipocytes (cells producing fat). Also, it interacts with adipose tissue to induce expression of adiponectin, the major anti-inflammatory agent produced by adipocytes. What it means? Turmeric reduces obesity and related disorders, thus reducing atherosclerotic risks. Dosage. Turmeric can be taken on a daily basis as part of the regular diet, in curries. Due to its low absorption in the body, it is suggested that one can intake turmeric with black pepper to enhance the absorption rate. Cut root: 1.5 – 3 g per day Dried, powdered root: 1 – 3 g per day. Standardized powder of curcumin: 400-600mg 3 times a day. Fluid extract with 1:1 concentration: 30-90 drops per day. Tincture of 1:2 ratio : 15-30 drops 4 times a day. Precautions Although turmeric does not have any known side effects, the following people should be aware about the intake of turmeric supplements and should consult the physician regarding the dosage. People taking blood-thinning medications (increase blood flow to brain and reduce risk of blood clots) must consult the doctors before having turmeric.Turmeric supplements should be avoided by pregnant women (may promote uterine interactions) and breast feeding women. Excess dosage of turmeric may cause nausea, diarrhea, rashes in patients allergic to turmeric. Also turmeric should not be had before any major surgery (interferes with blood clot formation). People having stones in gall bladders should consult doctors before having turmeric. Research studies have shown that turmeric can help in multiple ways in case of atherosclerosis. Of course the results vary based on various factors too. It is best to include turmeric in your regular diet to get its benefits and prevent disorders and helping in treating existing ones. If you found the article useful, please share the benefits of turmeric with your family, friends or colleagues. Posted by Werner Schmidlin at 9:33 AM Labels: Turmeric. This is very interesting, Werner. Thank you! Hi Werner, Terrific article on Turmeric. Thanks! Another good way. A can of or homemade pumpkin soup, small can tuna, 1 beef stock cube, ground pepper. 3 teaspoons turmeric stirred in – mind you it can be used in almost any soup or casserole. The ground pepper brings a finer flavour so too the stock cube. It is a meal in itself. Great for your immune system. Thank you Werner for this reminder of the wonderful benefits of consuming Turmeric. After reading this; turmeric has now a place in my kitchen. Thank you Werner, you are a gem.